Craving some authentic Korean nosh but don’t have the time (or the cash) to hop on a flight to Jeju or Busan? We’ve got you sorted for top Korean spots in Hong Kong with picks that are (as the Korean saying goes) ‘jjang’ (the best). Time to chow down on some kimchi and bulk up on some bibimbap! There’s more to Korean cuisine than just Korean fried chicken (although we have to admit it’s pretty darn tasty). Here we share eateries that offer a creative twist on Korean food, as well as original and mouth-watering authentic Korean noms. Whether you’re planning a romantic dinner for that special someone or game for a more adventurous girls’ night out, these restaurants are prime for those who are Korean keen. 우리 시작하자! Desperate to satisfy those Korean chicken cravings while keeping your body in summer swimsuit shape? You’re in for a treat with the flavourful meats at Goobne Chicken, which proudly utilises tummy-baring friendly cooking techniques. Their Goobne Original Oven Roasted is made without any oil (gasp! ), which not only lowers fat content, but also saves you some extra calories so you can knock back a cheeky signature cocktail without feeling guilty. The Fruity Soy Garlic Chicken (our favourite) is enshrined with a crispy golden coating and crunch that will keep your mouth watering for more, but won’t break your calorie bank. Don’t forget to top it off with their Cheese Toppokki: a combination between Korean sweet and spicy rice cakes (see? healthy! ), and mozzarella cheese – a true win win! You can definitely chuck out the calorie counter with these Goobne goodies. If you’re all about that bass and Soju, this ‘pearl’ (JINJUU’s English translation) is the hub for multiple Korean beverages including cocktails, Soju, and fusions. 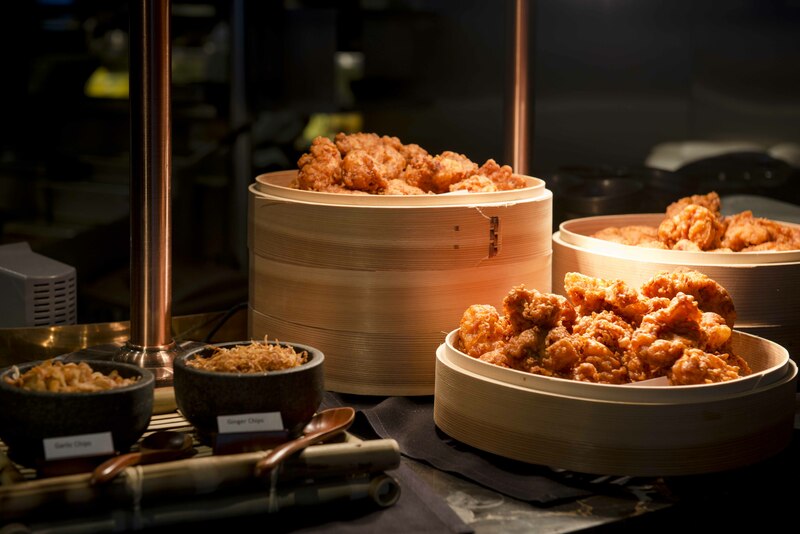 Located at the heart of Lan Kwai Fong, JINJUU comes to life at night with a poppin’ DJ to feed visitors’ souls while their Korean Fried Chicken Sliders satisfies their stomachs. Snack lovers, prepare to indulge in their Anju (bar snacks) like Korean inspired Tacos and Korean Fried Tofu Sliders – are you salivating yet? Their main dishes include the celebrated Bibimbap (natch): white rice and seasonal vegetables served in a stone bowl with Gochujang sauce on the side and a choice of either raw or fried egg. Add your own extras such as Bulgogi (marinated thinly sliced Aussie beef fillet), thinly sliced marinated Iberico pork belly, and needless to say, homemade cabbage kimchi. Sweet lover? Don’t miss out JINJUU’s signature dessert plate to share amongst your friends. We promise that you’ll leave happy, stuffed, and ready for your next visit. Boasting both a dapper bar and a more homey dining area, HANJAN dishes up the best of old and new Korea. Head over to chill at the bar for an easygoing night, or sit outside to experience ‘Korean nightlife’ in the roads of Central. We’re sure we’re not the only ones obsessed with their amazing Fist of Fury. It’s a pork knuckle dish made with special Korean herbs that you’ll have to try yourself to fully appreciate. (With a name like First of Fury though, aren’t you tempted already?) While you’re at it, tuck into a few places of their Kimato Cheese Balls – a tomato stuffed with mozzarella and kimchi that is guaranteed to get your taste buds singing its praises. While it means ‘one shot’, we’re sure HANJAN will keep you coming back for more. Italian Korean fusion might not be the most common fusion food around, but trust us, satisfying your curiosity will be well rewarded. Located near charming PMQ (just minutes away from Central), MOYO’s unassuming black exterior is easy to miss; inside, its spare, industrial feel places the emphasis squarely on the food. With a simple menu, choosing a delicious meal is easy peasy! We love their Marinated Tofu Salad (an aesthetically pleasing and scrumptious combo of lotus root, purple sweet potato, and apples), and you cannot miss their Pesto Rice Cakes – an east-west mishmash you won’t forget! Of course, you can’t go wrong with their Korean Fried Chicken (think tender and moist meat marinated in coarse, rich, peppery flavours). You’ll definitely be getting some chill vibes, great service, and even fab foodie fusion fare here. Whether you’re spending time with family or looking for an evening out, MOYO’s top-notch quality and quantity will keep your buds and tum happy. With ‘Demon Chef’ Alvin Leung at the hem, Bib n Hops’ Seoul street food stall offers up authentic, yet down-to-earth cuisine choices for diners. The dynamic and vibrant location, along with their cute personalised mugs and rustic old school vibe environment, completes the experience. Hop over to Bib n Hops for a filling dinner, or if food’s not your thing, knock down a few cocktails and beers – we don’t judge! Relish in their Chicken Wings that are to die for – made with their very own Bib n Hops sauce. (Shhh! it’s top secret!) Their Rice Donut Sundae is also a must-try as they put their own spin on western donuts: similar to your typical ring-shaped dessert, but made with sticky rice for that extra chewy consistency generously topped with berries, vanilla ice cream, and jujube. With good grub that tastes like it’s straight out of Korea, you’ll surely see us ‘hop’ in again! MOMOJEIN dishes up a luscious Korean cuisine experience unlike any other. Along with their chic and minimalistic décor, this menu introduces a groundbreaking culinary experience to Hong Kong! This isn’t your mother’s Korean cuisine, but rather a modern take that adds a bit of a twist to what would otherwise be ‘just another’ Korean restaurant. One of our favourite dishes has to be the Bulgogi Flat Noodles, perfect for those adventurous enough to try sweet potato flat noodles. It a first for us and we’d have them again any day! We all love a bit of sugar, and their Black Sesame Ice Flakes will surely satisfy those late-night sugar cravings, or can simply serve as a sweet finish to to a spicy, satisfying meal. We promise you’ll love the MOMOJEIN’s modern Korean nosh encounter as much as we did. What could possibly surpass the up and coming Korean foodie treats in HK? That’s right, a delectable chain restaurant that already has 70 restaurants across Korea! Prepare yourself for the long queues in front of Sodam Chicken where the most effortless, laidback, and intimate Korean restaurant awaits. Famed for their Korean fried chicken, diners should get ready to be rid of all table manners as you gobble and gorge on as much chicken and cheese as possible. Their selection of luscious fried chicken includes Cheese Chicken Waffles (fried chicken with waffles), Lava Cheese And Sweet & Spicy Cheese Grilled Chicken, and Cheese Fried Chicken (Mozzarella, Cheddar & Cream Cheese Sauce). This is a breathtaking dish of chicken with a pool of cheese and a bread bowl filled with, wait for it… even more cheese! Trust us, it is as delicious as it sounds. Their fetching signature cocktails include Yogurt SOJU, Grape SOJU, and Lemon SOJU just to name a few – and they’re served with light bulb glasses inside a huge cup (try one, you’ll understand!). An incredible Korean meal at Sodam Chicken is in store for you.